I am an artist, but I am also a yogini, and therefore my work is deeply inspired by my practice of yoga. Yoga has taught me to look for the beauty and goodness within and around me. It has taught me to embrace the fullest spectrum of my experience by helping me be with the dark parts of life as equally and gracefully as the delightful parts. I think of my art making practice as a practice of those teachings. In that way, creating artwork has become another aspect of my yoga practice. It has helped me to embody my own experience through understanding the movement, energy and physicality of a yoga pose and through the deeper meaning that a pose evokes. 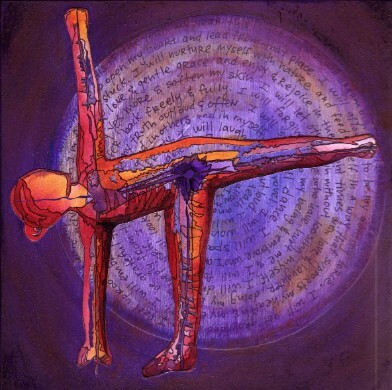 When I begin a painting of a yoga pose, I move into the pose in my physical body first. I feel the sensations of my feet on the ground, of my muscles engaging, of my breath rising and falling. Then I explore where the movement of energy is going, what emotions arise and what thoughts come up. In this way, I get to know the pose. Then I paint. I use fluid acrylics for their rich, bold color and soft fluidity. I paint the figure with flowing gestures and allow the paint to move around the page organically. I capture the movement of the paint in ink, and then cut away blocks of space that don’t seem to fit. Each step has its own meditative quality. In the last step, I sit with the painted figure and let words bubble to the surface. Sometimes they occur in fragments, sometimes they come out like poetry. The words usually have a quality of guidance to them, as if someone else was writing to me. These words and poems are juxtaposed with the painted figure on a wooden panel. I’d like to think that each piece I create has been infused with a quality of heart that I tapped into during the process of creation. At the beginning of a piece, there is often a quality that I want to cultivate. Doing so not only helps me step more fully into these qualities within myself, but (I believe) also empowers others to join me.